My hands clinging to the reins. The sound of hundreds trampling hooves humming in in my ears. I felt like Simba chased by the wildebeest. My legs entwining the warm and massive torso of the horse I was riding on. Next to me I saw another horseman falling to the ground. His horse went off as quickly as the other 50 ones. Iceland has taken a big chunk of my heart and I would like to share a personal story with you. As a filmmaker and photographer I create to feel, to learn, to share and to connect. My experience engaging with the people of Iceland over the past 4 years has taught me some life lessons I will never forget. Take Anita, for instance. A loving mother, teacher and she also runs a farm with over 30 horses. She and her family live in the south, near Hekla, one of Iceland’s volcanos. You can see its frozen tip from the veranda of their home. Surrounded by horses, sheep and their lovely dog, you quickly realize what really matters to them. It is their connection to nature, to family and how they respond to each. 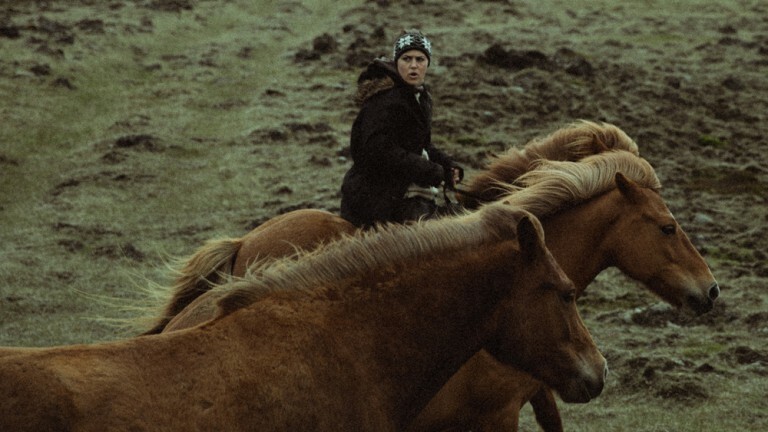 A few times a year, Anita, her husband and some other friends of the family have to train their horses by letting them run in the wild highlands of Iceland. By doing so, the horses build muscles and become strong enough for the horseback riding tours during the summer months. By joining them on this very special adventure made me realize two things. First, horses are so amazing. Riding is by far the most intense way of traveling and I love it! Second, you can always grow your family by opening your doors and let a stranger become a friend. They will be more that happy to welcome you on one of their horseback riding tours. And by the way, it is Anitas birthday today. Happy birthday! See you soon.